I tried Bane, it's ridiculous, clears OK with the same defensive witch (no DOT/chaos nodes). Rerolled as a Trickster to do Bane+Toxic Rain and it's crazy good. Bane kills everything but bosses basically, even ghosts are just 1 cast and they drop, and it has enough AOE that you can just wave it in the general direction of mobs. Better clear & bossing than the channeling witch so far (just starting a5). Ive switched over to Winter Orb CWC Ice Spear now, its okay. Charging Winter Orb is still annoying, but it kills anything below bosses with only GMP and Infused atm. Playing as a Divine Ire Totem Hierophant. Finally got into Ascendancy and now I have 3 totems. I'm using a Wave of Conviction Totem with Phys to Lightning to give a Lightning res debuff which really sets Divine Ire up. With One WoC totem and 2 DI totems everything gets deleted and none of my gear is particularly good. Can't wait to get some sockets. Puryfying flame shows promise. Seems slightly broken but we see how i manages to die :P Gonna go hierophant, hit 3500 dps when killing piety (2 hit her) Admittedly that is with the 8sec buff Elemental overload. Running a (FOTM?) Vortex/Cold Snap Occultist as a league starter is pretty fun so far. Never really made progress with either a Witch or this Ascendancy so having done Cruel lab and being super tanky with a one-stop run in and blow stuff up build is neat. My gear is not great, but can already just run into a pack and nuke them before the ES even starts to notice. Not sure how it'll scale endgame, but shouldn't be too bad IMO. The forums say it's fine, and being able to drop big whirlpools of damage then dodge attacks feels sensible. Being a lifelong bowfag I'm trying Barrage/Scourge arrow/Herald of Agony poisony type Ranger. Seems to be working so far - only lvl 50 currently. Half the time I have NFI what im doing even with guides and watching Mathi streams. It's super fun though. Would not pay money for a decent game again! 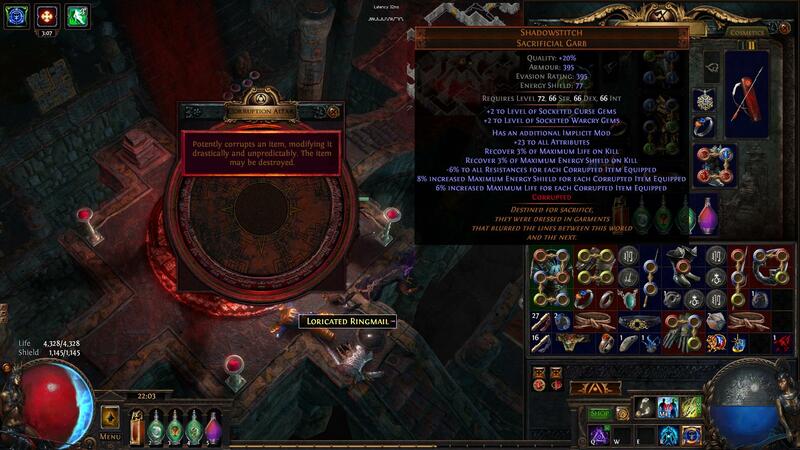 The joys of league start, i have a t3 corruption before ive even started mapping, and nothing to put in there. I think im not going to touch temple until i have a chance to make another Shadowstitch, that would be ace to have again. Also may have neglected defenses too much, but still have a chance to work that out. I only just noticed some wanker stole 30% of my resists. No wonder things were spanking me. Last edited by Sandzibar; March 12 2019 at 08:08:33 AM. Act1-5: Wear whatever drops with the right sockets / links. This bump should last you until Act10, then post act 10 you lose another 30% resists. It's usually a few C to get balanced after act 10 at most, though down to a few Alc in a week or so. Bane plays very similar, but with no cooldowns. It's dumb. In the best kind of way. I got a Carcass Jack drop so using that now. My Bane AOE is huge. P sure I'm hitting the # of mobs affected limit at times, and I'm not rolling for much pack size yet (only up to t3-t4 maps). League mechanic is very cool but clumsy. Yeah i am totally ignoring the league atm too. Saw some redditposts about it but it look stupid and the drops are too rare. Pulling a shitload fo currency out of incursions while waiting to prime delves for danger money. Swapped to CI tonight at 5.3k ES. seems pretty smooth so far with what i have. Clearing Alc'd T6 maps with a 4l Vortex and 4l Cold Snap so can't really complain. Main target for the next few days is working on my map pool. Speaking of mechanics, i didnt really minmax syndicate last league. Just always went for +rank and remove rivalry. But i saw some guy on stream essentially having max rivalries. Now that encounters are rarer, what is the right way to go about it? I guess Jorgin Fortification, It That Fled to Research, Cameria to Intervention, Hillock to Transportation and then just interrogate everything else? Just finished story leveling, was pretty faceroll with a 4link Storm Brand. My next plan is get to 80, do merc lab, hopefully be able to do Atziri a couple of times, then try to corrupt a Shadowstitch. GMP Winter Orb, CWC Ice Lance is beastly boss damage without any support. I wonder how hard it takes off with slower proj gloves, i am running out of sockets atm with two 4-5 link offense setups and a CWDT Vaal BV curse on hit. edit: Lol at the synthesis crafting. How is anyone with basic stash space ever going to do that? Last edited by Lilalaunebör; March 12 2019 at 11:47:23 PM. Rivalries give more options to Execute for the rank up, either because it blocks other options, or makes more people show up to the encounters. Tbh all i want is Aspect of Spider from Jorgin, and maybe even some loot from Mastermind. SSF and all that..
Hit me up if you need LAB help. Am 3/6 for Uberlab which feels far quicker than normal. Hopefully be at 4 or 5 by the weekend, camp 820 and get it done for that sweet final ascendancy. At 3/6 myself, but not looking to rush it. Making do with what drops is fun, normally i dont think anyone would be excited about getting Malachais EE ring, but im making it work atm with flame golem. Really banking on that Shadowstitch, or even a +2 Tabula wouldnt hurt right now. All times are GMT. The time now is 01:16:20 PM.